Black bear attacks on humans are highly unusual, according to the Michigan DNR, but can occur if a sow is protecting her cubs. The Michigan Department of Natural Resources announced Wednesday, May 11, that a black bear recently shot and killed in Haring Township, north of Cadillac in Wexford County, is the same bear that mauled a teenage girl, Abby Wetherell, in that same township in 2013. The DNR confirms a 9-year-old female black bear was killed April 30 by an individual, who wishes to remain anonymous, acting in self-defense. The individual let out a dog, which then immediately ran after what appeared to be a bear cub. The dog was stopped at the end of the tree line barking when the owner saw a bear appear and attack the dog. The individual went to assist the dog and the bear ran off. As the owner attempted to render aid to the injured dog, the bear retuned to the scene and approached the resident, who then shot the bear. The situation was reported to the DNR and investigated. It was determined to be a justifiable killing of the bear. The bear carcass was sent to the DNR Wildlife Disease Laboratory in Lansing for pathology review. DNA samples were sent to Michigan State University for genetic testing. MSU’s Jeannette Kanefsky of the Molecular Ecology Laboratory did the genotyping. The Wetherells were informed late Tuesday of the findings. Through a process called “cementum annuli analysis,” DNR wildlife biologists examined the bear’s teeth to assess her age and number of litters. They determined this bear had three litters throughout her lifetime, including in 2013 when the mauling took place. It remains uncertain whether cubs were in the vicinity when the attack on Abby occurred. 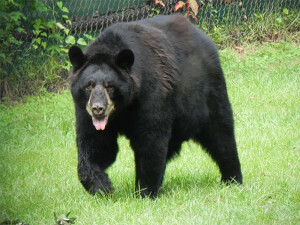 After the attack on Abby, the DNR put extensive effort into setting traps and responding to bear activity in the area. Michigan has an estimated black bear population of approximately 11,000 bears, with roughly 80 percent of the population in the Upper Peninsula. There is an established bear population in the area of Wexford County. The DNR reminds the public that black bears generally are fearful of humans and usually will leave if they become aware that people are present. Bear attacks on human beings are highly unusual and in most cases occur because a sow is protecting her cubs. • To avoid surprising bears, travel in small groups and make noise. • If you encounter a bear, stand your ground and then slowly back away. Do not turn away. Do not show fear and run. Do not play dead. • Make yourself look bigger and talk to the bear in a stern voice. • If actually attacked, fight back with a backpack, stick or bare hands. For additional information on living with bears, visit the DNR website atwww.michigan.gov/bear.